Our newest office space is open and ready for you to move in today. We are here to help you, with the various options available you can find just the right spot for you. 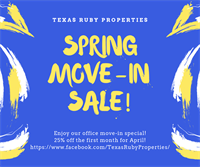 For the month of April, we are having a move-in special for our office spaces.